With parts of Australia in the grip of a heatwave this week, the proposal of a new icy pole should be welcome, unless it's a Vegemite icy pole. The beloved product took to Facebook this week to provide a recipe for the unthinkable, and the internet is literally in melt down over it. 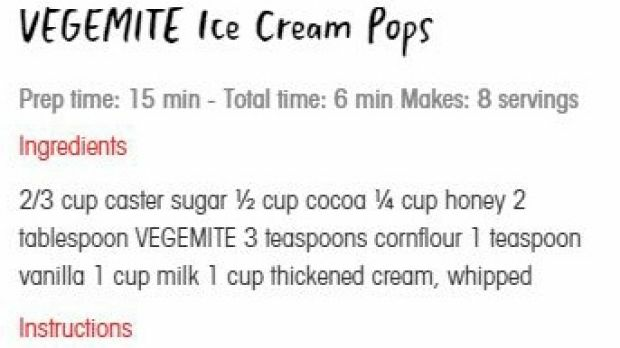 Mums and dads have always joked with their offspring about gross fantastical foods such as fish milkshakes, worm sandwiches and, well, vegemite ice cream, however someone at Vegemite went the extra mile to actually create a recipe. So what's in this outlandish recipe and are you going to try it? The post has already attracted more than 3800 shares and 12,000 comments, with some saying it's a disgusting proposition and others 'conflicted' by the idea of their favourite spread in an icy treat. Vegemite is for toast, not for ice blocks. What is this world? Fun prank: buy Vegemite ice blocks, swap with chocolate Paddle Pops, offer to friends, watch reaction, go into exile in the bush. Vegemite took to Twitter with an hilarious response to the controversy created by its recipe with the caption, "TFW (That Feeling When) you accidentally divide the nation," with a GIF of Kath from Kath and Kim. One thing is for sure, though the nation might not be convinced, this is one funny PR stunt, made all the more funny because it wasn't hauled out for April Fool's Day.